How Did The US Markets Respond During Watergate? The effect of public confidence upon capital markets is one issue that has gone largely ignored for decades. In our August 8th, 1994 edition of the Princeton World Report, we provided a study of gold dating back to 1721. 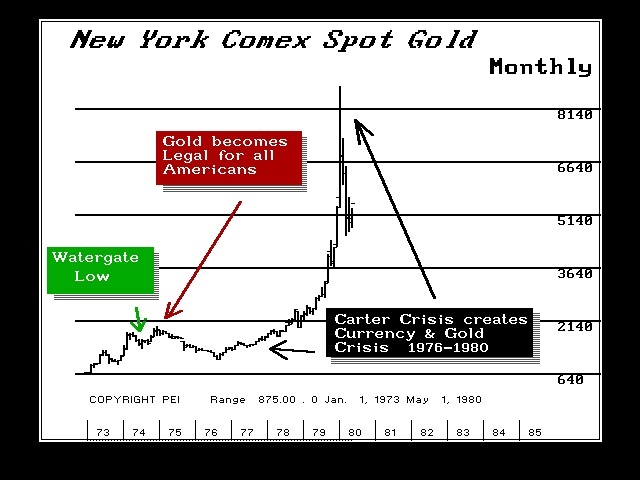 Every major rally in gold was linked to a crisis in confidence centered around government. Such was the case during the Panics of 1864, 1869, 1893, 1907, 1929, 1974, 1980 and 1987. In each and every case, gold rallied when the full faith in government came into question. The extent of each rally was governed by the extent of concern in each situation. The Watergate scandal of the early ’70s was no exception. That scandal set off two trends as the story began to build in momentum. The bonds and stocks declined as gold rallied. We have provided the Princeton US Bonds Index(TM) which is a perpetual nearest futures contract extended back in time to the birth of the United States using cash bond data. Our illustration shows the steep decline beginning in January 1973 as the Watergate scandal began to grow in importance. The bonds continued to decline throughout this crisis until the resignation of Richard Nixon during August 1974. From the 1972 high of 142.03, the August 1974 low was established at 86.29 during the week of the 26th. Following the resignation of President Nixon, the US bond market recovered moving higher going into the week of February 17th reaching the 99.31 level. The fact that the crisis at least came to an end, helped in providing a slight rebound in public confidence. The Watergate low of August 1974 held until it was penetrated during July of 1978 during the financial crisis years under President Carter. The US stock market (basis S&P 500) also peaked during January 1973 at 120.24. As Watergate continued to grow in significance, the S&P 500 fell almost relentlessly with the exception of a 2 month rally during September/October 1973. The S&P 500 fell reaching its lowest monthly closing in September of 1974 following Richard Nixon’s resignation. The subsequent rally that followed, took the S&P 500 back up into September 1976. 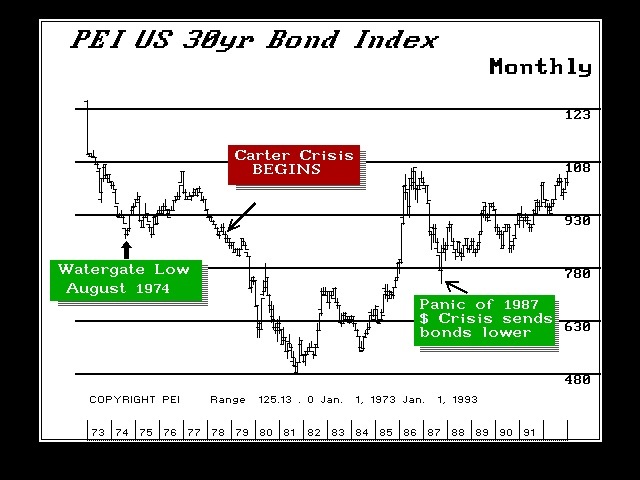 Eventually, the stock market rallied going into 1980 during the Carter Crisis period when the bonds continued to fall to new record lows. Capital became concerned about government and a flight to quality began. This resulted in capital fleeing the bonds markets and moving directly into the share market. Gold’s response to Watergate was similar to that of the bond market. However, the legalization of gold for American ownership due in 1975 caused the rally to resume going into December 1974 on wild European speculation that had anticipated a huge demand from American citizens. After a brief reaction low during July 1974, gold rallied going into August of 1974 and then fell sharply into September following Nixon’s resignation. 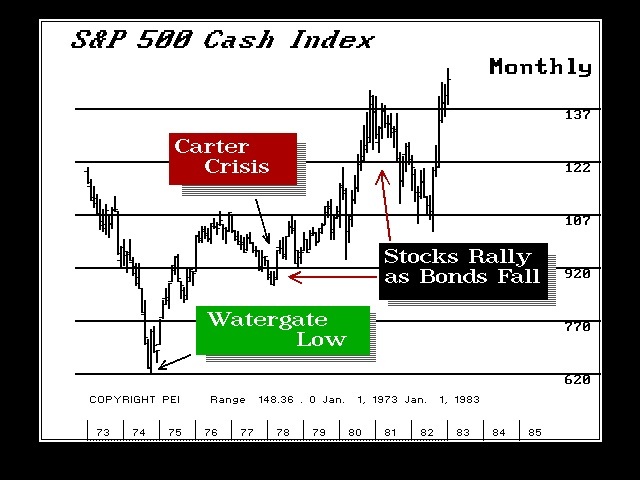 During the Carter Crisis years, gold rallied along with the stock market going into 1980. However, gold outperformed the S&P 500 due to the fact the dollar was declining sharply on world markets. Gold acted more as a hedge against the currency decline since it is a non-national commodity with international value. Political uncertainty is never good for the domestic markets of any nation. Nonetheless, such political turmoil must be viewed from an international perspective as well. There is little doubt that the Watergate affair helped to create a bearish trend for the dollar and US assets. Still, this trend came during the OPEC crisis, which also had its impact upon future expectations. The crisis was merely compounded by the fact that Nixon was followed by Ford, who did little to restore confidence, and then by Carter, who destroyed America’s credibility. These three political events combined ushered in the rejection of liberal democrats with the election of Ronald Reagan in 1980.